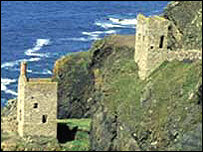 Cornwall's bid for World Heritage site status will be sent to the headquarters of Unesco on Monday. The final decision from UNESCO, the United Nations' cultural organisation, is expected next year. The bid, backed by Culture Secretary Tessa Jowell, details Cornwall's role in mining over 4,000 years. A management document explains how the historical mining areas from St Just in the west to the Tamar valley in the east will be looked after in the future. Mrs Jowell said: "This unique industrial and cultural landscape survives as a tribute to one of the most rapid periods of economic, industrial and social development the UK has known."